Definition at line 22 of file ARCInstPrinter.h. Definition at line 24 of file ARCInstPrinter.h. References getRegisterName(), MI, llvm::RISCVFenceField::O, printInst(), printInstruction(), and printRegName(). Referenced by ARCInstPrinter(), and printRegName(). 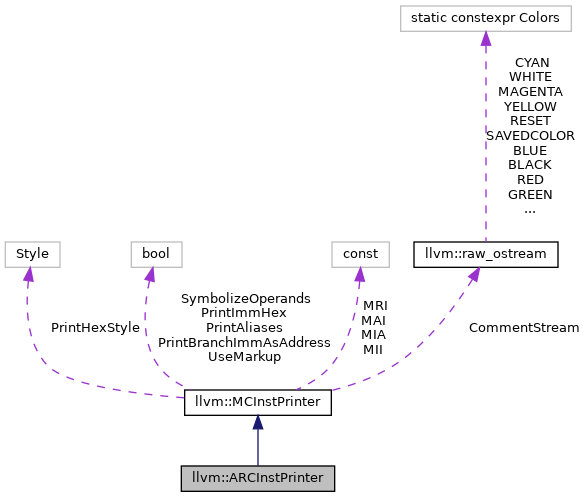 Definition at line 100 of file ARCInstPrinter.cpp. Referenced by ARCInstPrinter(), and printInst(). Definition at line 96 of file ARCInstPrinter.cpp. Referenced by ARCInstPrinter(), and printExpr().